Zhores I. Alferov is a Soviet and Russian physicist and academic who contributed significantly to the creation of modern heterostructure physics and electronics. He is an inventor of the heterotransistor and the winner of 2000 Nobel Prize in Physics. He is also a Russian politician and has been a member of the Russian State Parliament, the Duma, since 1995. Lately, he has become one of the most influential members of the Communist Party of the Russian Federation. 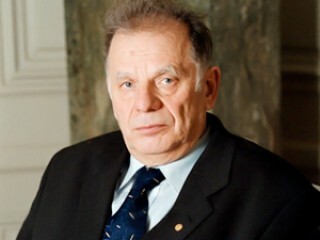 Russian physicist Zhores I. Alferov conducted breakthrough research into III-V semiconductor heterostructures, including detailed studies of epitaxy processes, injection properties, lasers, LED’s, and solar cells. His work provided the basis for the optical semiconductors and the solar cells that made the Soviet Union's Sputnik program possible, earning Alferov the Nobel Prize for Physics in 2000, shared with Herbert Kroemer and Jack S. Kilby. Nobel Prize in Physics for 2000 (together with Herbert Kroemer and Jack Kilby).